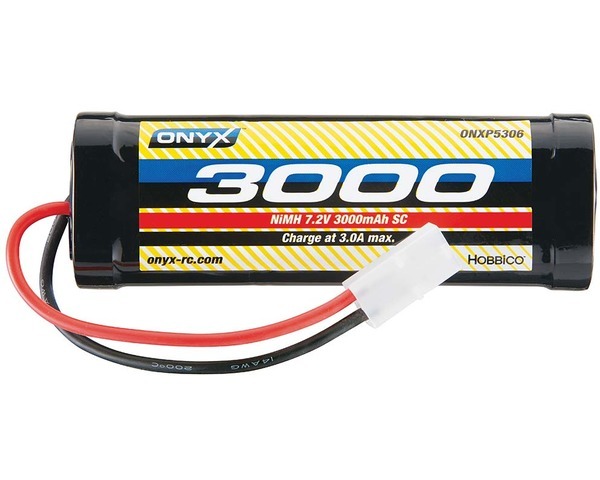 This is the Onyx 7.2V NiMh 3000mAh Stick Battery with Standard Plug. 2-year limited warranty-Onyx brand batteries are warranted to be free from defects in materials and workmanship for a period of two years from the date of purchase. During the first twelve months, ONYX will, at our discretion, repair or replace without service charge any product deemed inoperable due to those causes. After the first full year of warranty coverage ONYX will provide extended warranty coverage for another 12 months covering only defects in materials and workmanship. Extended coverage is limited and does not cover problems caused by abuse, misuse, and improper maintenance, failure to follow instructions, ordinary wear, or use past the battery s maximum rated number of cycles.